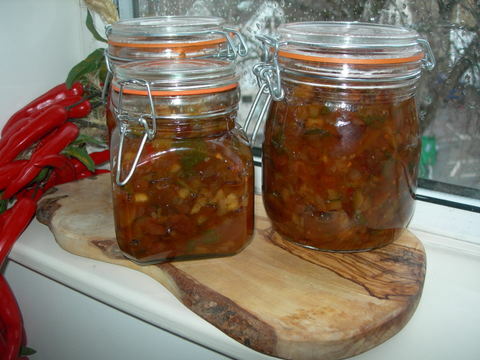 Homemade Scotch Bonnet Hot sauce: Thrifty Central heating. Over the years my addiction to hot sauce has had to be controlled, I first noticed it becoming an issue whilst at university. Alongside Tabasco, Maggi seasoning also became a weakness, I soon found most meals began tasting of one or the other and felt it was time for a change. Thankfully the only thing that gets the Maggi treatment these days is a few drops when making a dressing or on spaghetti carbonara. My Tabasco kick comes once a day in mugs together with a beef stock cube, Worcester sauce and a good squeeze of lemon juice; the Virgin Bull shot is a welcome change from tea or coffee and keeps the junkie within a happy lad. Gradually, the kick generated by a bottle of Tabasco began to wane. I wanted more fire in my belly, something guaranteed to bring a bead on and release a few extra endorphins. Encona became the new kid on the block. Working my way up the Scolville scale from Jalapeños to Scotch Bonnets was a bold decision indeed, a macho move in the world of the amateur hot sauce aficionado. Unfortunately, as agreeable as I found it, my stomach felt otherwise. Hot sauce hangovers can be more uncomfortable than snorting wasabi or eating a bag of holly. A good thing too, as I didn’t want to find myself tucking into extract sauces in a few years time. During my time living in London, flat hunting was always quite an exciting time, despite the fact that flats to rent would drop off the market faster than a public school girl’s knickers at a polo match, eventually something would turn up. I only ever had one condition: it must have outdoor space. Whether it was a Juliet balcony, a large window sill or even a disused patch of unkept ground (I think I had them all), I was always keen to make it into something worthwhile and productive, and what better way than to supply the kitchen with fresh vegetables and, on occasion, the odd invertabrate. The Tree house diaries: Building “The Patch”. Six months living off wild food is no easy task, while planning my tree dwelling experiment; I felt it would be a good idea to take my inspiration from the transition of the Mesolithic to the Neolithic. Whilst probing the recesses of my mind for the archaeological knowledge stored away during my degree, I seemed to remember it was around 4000BC that the Neolithic kicked in, bringing with it the domestication of animals and crops. As wonderful and diverse as the wild larder is, I felt it would need the support of a small, yet productive vegetable patch, carbohydrates for one. 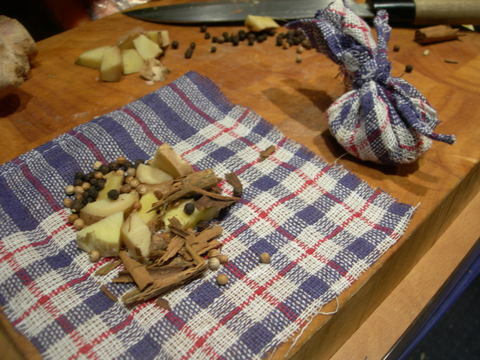 Burdock roots, dandelion roots and cattails are all very well, but why not have a glut of potatoes too? 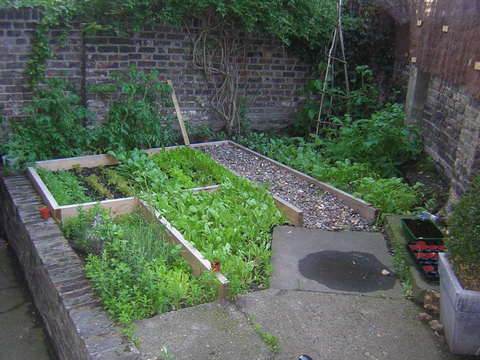 It would be good to have some crops to fill in the gaps where the wild foods are lacking. Pumpkins aren’t just for Halloween. Why ruin a perfectly good pumpkin? Every Halloween you see 100’s of ‘Jack-o’-laterns’ in peoples windows and porches each emitting a faint eerie glow through sketchy-carved out features, not that I am one to poo-poo a time honoured tradition. When it comes to the end of October I feel pumpkins should be purchased in pairs, not because they are particularly sociable vegetables, because one can be carved out and the other can be used for filling your belly. As I remember I used to be a bit of a dab hand at carving pumpkins, I loved drawing as a child and to be able to put a scary face on a vegetable was something you don’t get to do everyday. The only down side I found with carving a mean looking pumpkin and sticking it by the gates was that no-one would get to see my handiwork (not at the end of a half mile driveway on the forest anyway). The pumpkin’s association with Halloween was conceived in North America around the 1860’s and in folklore terms it had something to do with warding off demons. Cinderella used to get the fairy godmother to turn a pumpkin into a carriage when she went for a night on the town and even Harry Potter is quite partial to pumpkin juice or three. It is that time of year again in which this hardy perennial has begun to show its face again. The supermarkets are beginning to stock them, but those of you who look to search them out have, like me, been munching on them since the end of November. The odd thing about this vegetable is it looks like a cross between sweet potato and galangal (a type of ginger), tastes like Globe artichoke and is related to the sunflower. That is one confused root vegetable! The name comes from the Italian word for sunflower; ‘Girasole’ which has over the years become Jerusalem. The plant is native to North America where the tuber like roots were often used in the past as a staple in much the same way as a potato. The native Americans often referred to them as sun chokes. The girasole was brought over to Europe in the 1600’s and introduced to France by Monsieur Samuel de Champlain. The plant itself acts in much the same way as weeds due to its hardiness and unless controlled can spread. So for this reason growing your own is remarkably easy. There are so many different ways in which this wonderful vegetable can be transformed, mashed, roasted or pureed; it’s really all down to personal preference and experimentation. So I will give you mine, which makes for a superb, yet different starter. 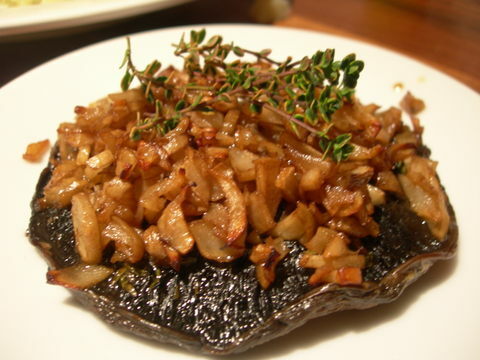 Jerusalem artichokes with balsamic and Portobello mushroom. Method: Once you have peeled and finely diced your artichoke, melt some butter in a pan and add the artichoke. Fry on a low heat for 5-10mins until softened, add the thyme, lemon juice and balsamic and salt and pepper and reduce on a high heat, when you reduce a liquid fast the flavours will remain strong and intense. After a few minutes of reduction remove from the heat and pour over your Portobello mushrooms, these should then be seasoned and placed in the oven at 190C for 10 minutes. This is such a fantastic combination of flavours owing to the nuttiness of the artichoke, the beautiful flavour of the mushroom nicely cut by the balsamic. A simple starter which does confuse a lot of people and they will be bound to ask what the artichoke is…it’s in season now so don’t waste time, their not around for long! Papster's Sun blushed tomatoes: The English way! I simply had to put this up, my friend Justin (the papster) told me about this. So as you can see all, credit goes to him! As we are not a country that can rely on sun, a cheap way of creating the condensed flavour you get from sun blushed toms is to simple and effective. 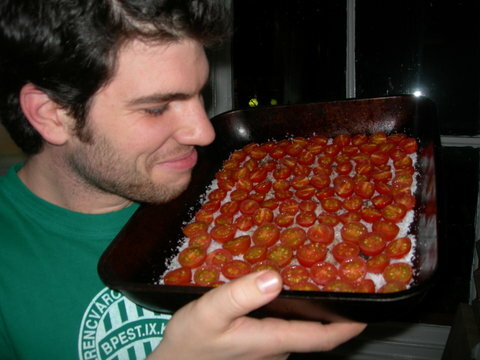 first line a baking tray with rocksalt, take a pack of cherry toms cut them into halves and place on top of the salt and blast in the oven on 200c for 5-10 minutes. Turn the oven off and leave them in over night, the next morning chuck them in a jar with some good olive oil and enjoy! The flavour will be more intense than your usual tom and slightly salty, most of the moisture would have gone. Remember to keep the salt and use for the next 10+ batches, because you will do them again. Pimiento de padron-the Russian roulette of tapas. After ten days in Mallorca and many meals later, one thing I must say is that mallorcan gastronomy ain’t up to much…don’t get me wrong I did have some superb meals, one very memorable meal was a El Molino in the town of Pollenca on the North shore. The food was outstanding, but the chef was English and had received his training throughout the west end at various restaurants including the ivy, it was Mallorcan cuisine done well. The one thing I did enjoy thoroughly was the tapas, who doesn’t? One thing I had not had before was Pimiento de Padron, small chillies fried in olive oil and rock salt and served hot, truly outstanding. These chilli peppers are named after the town of Padron near Galicia in Spain. In the 18th century Franciscan monks from Mexico brought these little green peppers to Europe, each year they have a festival of pimientos to celebrate an important part of their heritage. Everywhere in Mallorca and Spain we went you can always get them and as you can see I had to go to the supermarket to get my extra fix! They couldn’t be easier to make and the most intriguing or if you like, off putting thing about them is the fact that 1 out of every 5 could be really quite hot. The majority are fairly sweet and well balanced as with normal peppers, but this makes the whole process rather like a culinary Russian roulette. I am not sure whether it is possible to buy these peppers in farmers markets, but as I understand the 2007 season in fair-weather nation has sadly come to a close. You can obtain them from a farm in based in Hampshire over the Internet at www.ukpeppers.co.uk. If you ever come across these peppers it is so worth buying a bunch, as they are a superb quick snack. 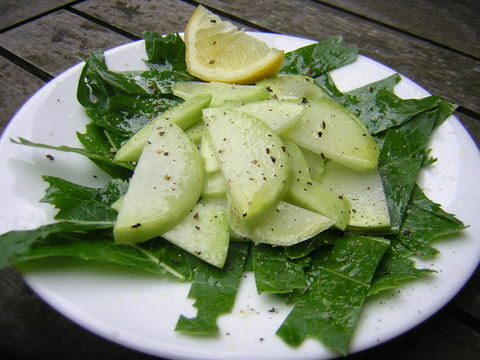 What on earth is Kohlrabi? It was with a mixed feeling of some excitement and nervous apprehension when I arrived home yesterday from 10 days in Mallorca…what had given me these feelings, you may ask? Burglary? Perhaps…the rent money? maybe. It was in fact the garden. Who would have thought that something like that would play with my emotions in such a cruel way? I never thought that something so insignificant would cause such a stir, but the simple fact is my garden has become something very dear to me for two simple reasons; firstly it is there because with a bit of hard work I made it so and secondly because it provides me with food on my table twice a day. So, to a certain degree it is a lifeline and at the same time it is my baby! When I say sample I mean try for the very first time, I must say it was a bit of a gamble to take on a vegetable I had never tasted and dedicate a section of my patch to it. All I knew was that it was a cross between a cabbage and a turnip and should not be left to grow bigger than a cricket ball as it starts to become woody and tasteless. You may call me superficial for wanting to add it to my patch because it looks quite cool and funky as vegetables go, but you cannot deny me the fact that I was taking an adventurous gamble into the unknown. 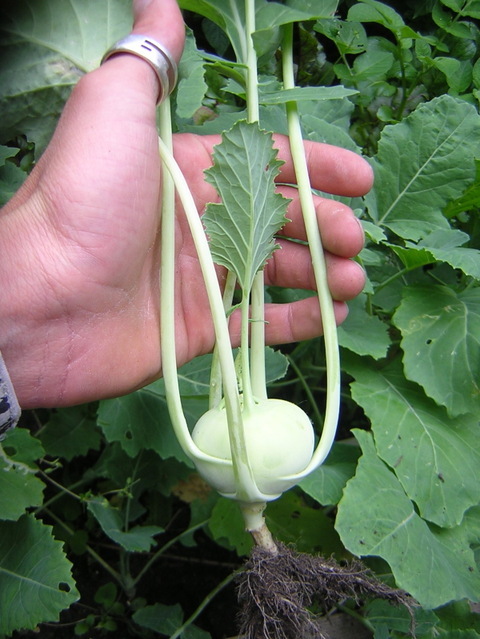 The name kohlrabi is German in its origin kohl meaning cabbage and rabi meaning turnip. This amazing looking plant is part of the super food group of the brassicas family (broccoli, cauliflower, cabbage and brussel sprouts) so it is undeniably good for you. Both the spherical, knobbly, sputnik-shaped root of the plant and the leaves are edible in its entirety…great! Although I have never come across it in a supermarket, I am sure it is readily available in farmers markets and in the smoke of London town you may find it in Borough market or our new American happy shopper the Whole foods market. As I parted the leaves that shot up form the plant below I got my first look at the treasure that had evaded my lips for so long, there were a few that were a little bigger than golf balls and were ripe for the plucking, lets not be greedy I thought, just the one for now. As you can eat it both raw and cooked I felt the best thing to do would to make a starter out of it and use both leaves and root for my first taste of this unusual vegetable. So after pulling my first kohlrabi from the ground I decided to chop the root in half and chop into thin slices and scatter over the chopped up leaves. A light dressing of olive oil, a squeeze of lemon and a little salt and pepper seemed appropriate. Of course I tried it before dressing it and I was shocked by the sweetness it possessed, but then again you will never get the same sweetness from any vegetable that has been shop bought, as I have mentioned before 20 minutes after being plucked from the earth the vegetables natural sugars begin to revert to starch. Once dressed I sat down in the garden to enjoy the fruits of my labour, a truly wonderful experience, I often get a weird sense of excitement when trying something for the first time and this was no exception. The flavour is tremendous, very cabbage like with the texture of a turnip and a natural sweetness I have only tasted in fresh asparagus. I think it would be a shame, nay an insult to cook this gorgeous little morsel, so it will remain eaten raw for as long as it lasts, I will most certainly be growing more in the future and I think it will be a firm favourite in my gardens to come. I may even bring myself to cook them in a way I can do them justice, but until that time I have the rest of the summer to enjoy the wonder that is kohlrabi and maybe some of my friends might just be lucky enough to have a taste too…but some how I just don’t know if I have enough to go round! 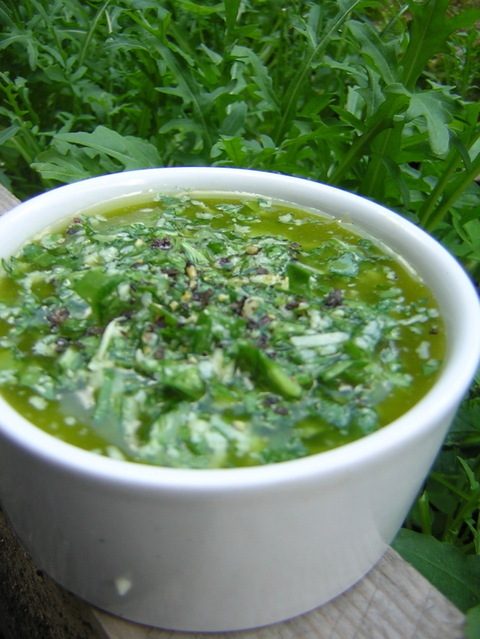 Pesto… if you dig about in your store cupboard or somewhere near the back of the fridge you will most certainly find, if not it has probably graced your kitchen at some time. Pesto is originally from the city of Genoa in the Liguria region of northern Italy and has been around since Roman times. In its original form it consists of basil, garlic, parmesan, olive oil and salt & pepper. That said the amount of variations that have cropped up over the last few centuries is staggering. 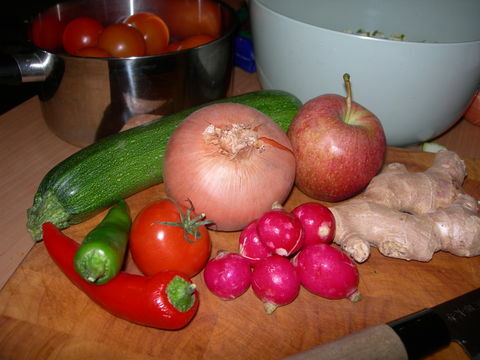 The most common being the original green pesto, which now contains pine nuts and red pesto made from sun dried tomatoes. For a number of years now I have been making my own pesto, it couldn’t be an easier base recipe and allows you to add or take away whatever you want. Variation is key, after some time you will settle upon what your preferred taste is in much the same way you would over a type of cocktail or sandwich. 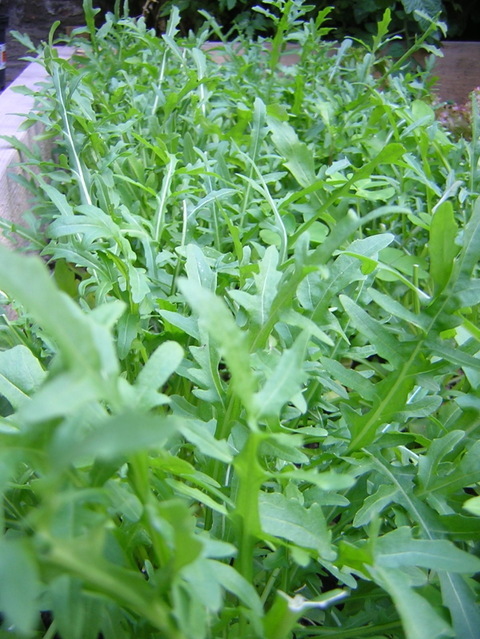 Right now in the garden I have a real abundance of the peppery little salad leaf. I am a massive fan and it is one of the easiest salads to grow, there is only so much that can go in salads so I decided it was time to make some rocket pesto. As I said I have come by my preferred pesto mix and it doesn’t contain pine nuts, I think maybe because if the original recipe didn’t, why should mine! 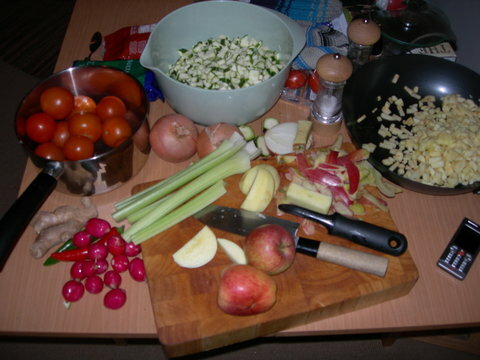 Finely chop all the ingredients, you can blend it but I find that chopping by hand gives a much more raw texture and looks way more appetising. Mix well in a bowl with a fork and that’s pretty much it. The best ways to eat your pesto as I am sure you all know, is to drizzle over pasta or use it as a dip for some nice crusty bread. Don’t be afraid to mix and match ingredients, pesto doesn’t have to be basil based. You can even make it half way between pesto and a salsa verde by adding a bit of mustard and some capers. The beauty of pesto is that there is no set recipe for it. Having said that I think I’m going to go and eat some I just made and photographed for this very entry! From Box to bigger things...the urban garden. Just before Christmas last year my girlfriend had had enough of our present dwelling and felt a change was due. House hunting is never much fun and comprises of a week or two of manic viewings and disappointment. I didn’t want to leave behind my window box and if I was, it would have to be for an upgrade. As luck would have it we found a lovely one bedroom basement flat which was perfect…it also had a garden, not a big garden but a beautiful bit of rocky wasteland all the same. We moved to St.Johns hill and became one of Clapham’s many “professional” couples. The garden was going to need a lot of work, but all I could picture were rows of lush lettuces and spinach, maybe some tomatoes and a wooden frame with sweet peas dangling off waiting to be plucked. In reality I had more than my fair share of graft to put in if my vision was to become reality. So there you have it a complete inventory to my patch. How I would manage to fit all that into a 13’ by 11’ space, I didn’t know, a more mature green fingured enthusiast might be appauled by the way in which it would be crammed in. To me however, it would be a beautiful sight to behold and pure bliss to water everyday before work, also this is a learning curve, as an excuse or not it puts my soul to rest. The next stage was one I am glad I wont have to repeat for some time. As I mentioned my patch had more than its fair share of stones, way more! I spent a backbreaking 2 days digging and sieving the stones out of the soil, I had more than enough stones to fill in my little garden path and managed to find a 1950’s dump consisting of ink wells, bottles and allsorts. Once this was done I found the soil was actually pretty first rate, this meant spending less on buying in fresh soil. Bonus! Planning the garden and working out what to put where was interesting, different vegetables prefer certain other vegetables as company, to avoid any disagreements or full on veggie punch ups I was going to have to tread carefully. I had to divide them up into sections. 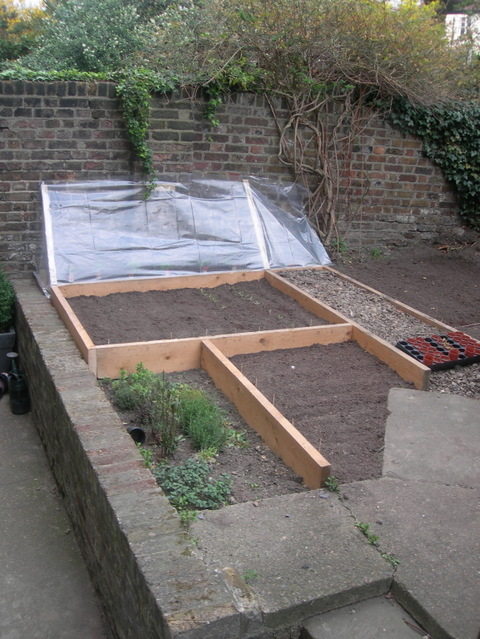 This was done first with string, the string would eventually be replaced with 6” by 2” planks to create a sort of raised bed. As luck would have it my brother had a pile of planks round the side of his house, so after some careful measurements I nipped round on a Sunday afternoon and cut some down to size. Once laid out and screwed together my garden had begun to look quite the little haven I hoped it would be. Meanwhile my seedlings were off to a flying start and could wait to get their roots in, the majority of salad leaves and spinach were going to go straight in as seeds but the tomatoes, sweet peas, beans and potatoes were going to need to be transplanted. My soil situation was looking good but needed topping up to get the 3 foot depth and extra nutrients that would prove to be paramount to success. A quick trip to Homebase was in order and 20 minutes later and £20 poorer left me struggling to the car with 3 bags of organic compost and 3 bags of organic soil. 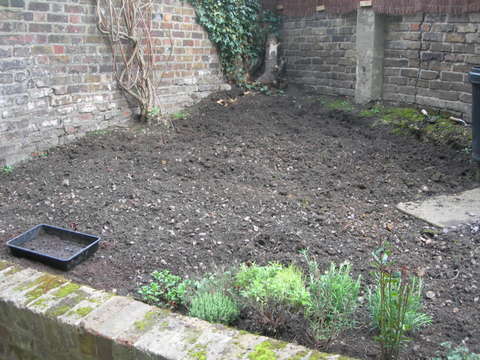 All that remained was to empty them into the new beds and mix in with the existing soil. The carrot and beetroot patch were the only section that didn’t get a dose of manure, apparently it disagrees with them. The finishing touch to the garden was a little gift to the peas and beans, a 5 foot miniture wig-wam of hazel uprights I had cut from Sussex were placed in the corner, which were then woven together with thinner lengths. I hoped both would oblige by climbing up it and adding a splash of colour with their flowers, but that remained to be seen. The way in which we are constantly drawn to new and different things as we grow up is all part of ageing. Wine often gets better with age, objects become antiques and their value is increased. I believe the same can only be said about the discipline that is gardening...vegetables that is. If someone turned round and told me I was going to have a vegetable garden when I am 25, I would have laughed in their face and told them where to go. 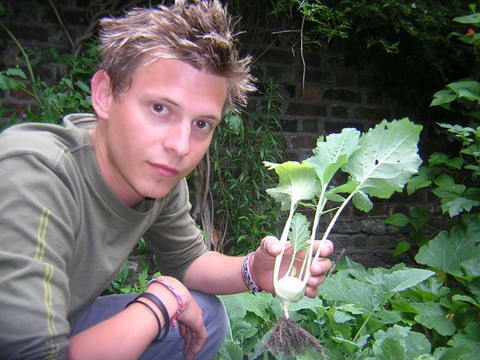 How times have changed and here I am with my first proper bit of land, which has been turned into a truly amazing little vegetable garden. Only in the last few years has my interest in growing developed and that began through my passion of cooking, which began through my passion for eating. So, this whole saga along with life goes in stages and there is only one place to begin…when I was 5. Gardening was certainly not a priority then, but more of a chore. My father would be out with the rotavator roaring down the proposed vegetable beds, churning up the soil and I had to go behind picking out rocks and more importantly worms for our regular fishing trips to the River Ouse. The greenhouse was host to big bushes of parsley, bulging bunches of ripe tomatoes and a whole host of various pots, trowels and other gardening implements. It was on a rough piece of ground next to this I was allocated my patch and as I remember I only grew carrots, and not many of them either. The mind of a child moves on very fast! 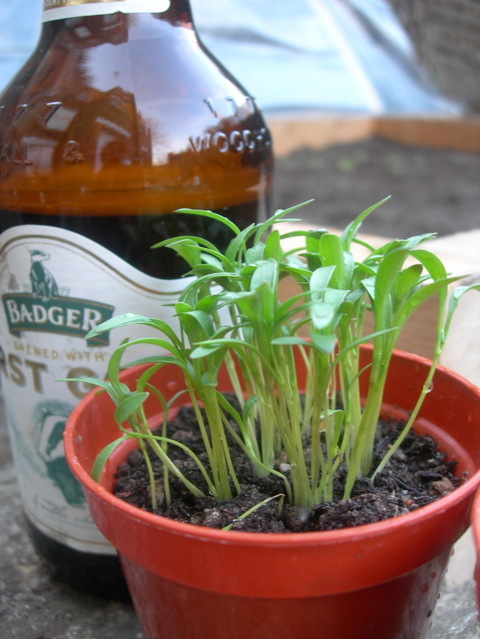 When the first signs of green fingers began to emerge 15 years later it was at university, this manifested itself in a) A basil plant on the window sill b) a couple of marijuana plants in a cupboard upstairs. To be fair both did very well but it was only the latter that held any real appeal as a student. From here I realised if I could grow an illegal plant, which wasn't even meant to grow in Britain’s harsh climate; I could grow anything. I studied Archaeology whilst at Newcastle and I had begun to specialise my studies in Hunter- Gatherers and the dawn of the Neolithic age, this gave me a different angle on the origins of what we eat and why, the domestication of plants and animals and its spread throughout the globe. So it was also to a certain degree in archaeology that lead me down this garden path (pun most certainly intended). Thankfully we all grow out of being students very quickly and once I had come to London, got a job and my first flat, I decided now was the time to up the stakes. I had no real idea of what I was going to grow, let alone anywhere to grow it, being on the third floor of a small building just off Battersea square. I did however, have stacks of enthusiasm and a set of double doors with a juliet balcony with big steel railings. The idea came to me one evening as I was standing at the balcony; a sort of hanging window box would be perfect for the job. 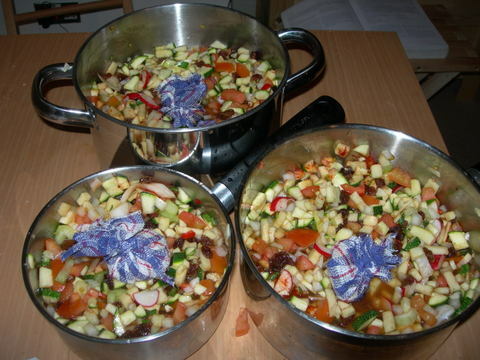 My cooking skills were becoming better and my range of recipes expanding, I wouldn’t be able to grow much but “container” gardening sounded very appealing. 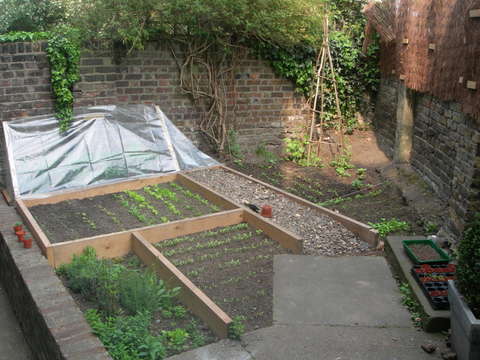 This is the stage at which growing vegetables becomes firmly engrained in oneself, the fundamental building block on which all future gardening experiences, good and bad are laid. Container gardening is ideal for all that have a balcony or even a window sill, therefore perfect for city dwellers. To those of you who already have green fingers, I salute you and you know exactly what I am talking about. During my daily commutes, I would stare out of the train at all the disused gardens and empty balconies and wonder why more people hadn’t cottoned on to growing their own. I am a firm believer of the phrase “if you a job done well do it yourself”, what I needed was not a run of the mill window box from Homebase, but something more sturdy and able to fit my balcony railings. As I worked as a set designer, I had an entire workshop and plenty of scrap wood to play with. Once I had knocked up a box that was a 1.5m x 50cm x 50cm, painted it black, varnished it and attached chains for hanging I was ready to go. What to grow? As I mentioned earlier your knowledge increases with experience, so I went for herbs and salads, a great starting point. In my box I had a simple armoury of Sage, Thyme, Parsley, Bay, Chives and Rosemary. The rest of the space was left for Spinach, Cayenne chillis, Lola rosa, Rocket and Raddioccho. Not a bad repartee, I am sure you will agree. I felt that these worked best for me because they are mainly for flavouring my cooking experiments and fresh salads for starters. The key to my success was for three reasons. Firstly, aspect. My window box was positioned so it got sun for most hours of the day. Secondly, my growing medium (essential for a good start and excellent results) consisted of 60% organic soil and 40% organic compost. 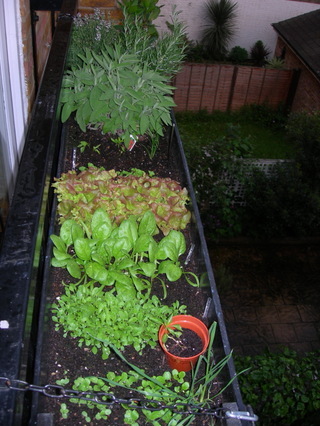 Finally, I was three floors up and had no risk of slugs, snails and other insect problems. The only problem that did occur was the wilting of some of the lettuces due to lack of water and the spinach, rocket and lola rosa running to seed because of too much sunlight. Here I learnt two valuable lessons for the future. It would not be for another year that I would be faced with a greater challenge as far as growing vegetables goes...and one that would allow for more variety and even greater potential.